A new cafe near the end of Carter Lane – close to the City Thameslink exit – this is a coffee purist’s spot. The energetic guys behind the coffee machine know their coffee, and offer advice and cheerful suggestions as well as lessons every Thursday evening. 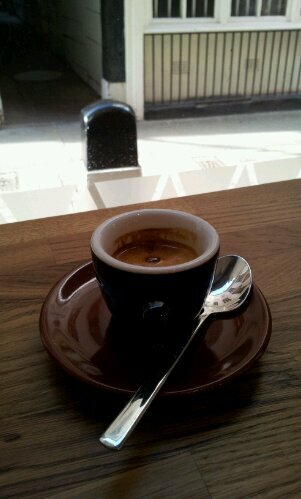 I tried the ‘Elixir’ espresso blend from El Salvador, Ethiopia and Bolivia – which was lovely. There’s also single estate – from Guatemala. There are 12 stools around the windows and the modern interior is uncluttered and simple. There are a few items to eat – croissants and the like. Posted on May 9, 2013 October 11, 2015 by espressolovinPosted in City of LondonTagged gourmet, hipsters.